If you have already read this http://www.bbc.co.uk/news/uk-england-london-19049239 and think traders in Greenwich are just moaning, and not getting into the Olympic spirit, then I am here to tell you that's really not so. 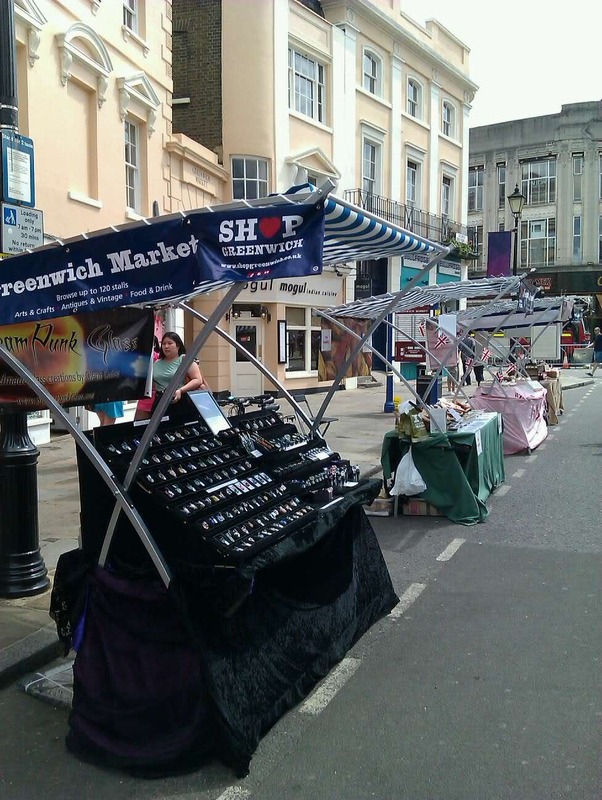 Before the Olympics we were told by the that the Market and shops in Greenwich were vital in helping absorb people leaving the equestrian events to stop the train stations being overwhelmed by so many people trying to get trains when the events finished at the end of the day. The market had to change layout and reduce stalls to make it more 'permeable' to visitors so it could soak up more people. The trading hours were changed from 10-5.30 to 12-8pm, with many traders still getting there early to be set up by 11am, all to help keep people in the town. I even agreed to set up my stall outside in the street to help showcase the market. And so at the end of the event everyone was marched past. Barriers remained in place. Normal shoppers avoided the area because we've had bizarre announcements on the buses from Boris Johnson telling people that London is going to a terrible place to travel. I spoke to one stall holder on Monday who'd come from London Bridge (there had been warnings on all the news reports the night before to avoid it as it was a 'hotspot' and would be packed) who told me he'd had an entire train carriage to himself. I was outside on Saturday, and before we'd even started setting up officials came an complained the stalls were about 14inches too close to the barriers - which were some 4ft away from where we were. Not that anyone over on the distant pavement could get to us if they did see us. If people did want to investigate and try and go through the few gaps in the barriers officials stood in the gaps pointing which giant foam 'pointing finger/hands' to direct people to the stations - where doubtless they all then had to queue for ages anyway in an ever growing crowd. So I spend a depressing day trying to keep my stall clean as the wind blew dust and dirt onto everything whilst thousands of people ten feet away streamed past. I know there have been official complained to ODA (Olympic Delivery Authority) and LOCOG (whatever that's supposed to stand for!) but I don't know if there will be anything fixed quickly. If nothing changes quickly I really may have to close completely for the next six weeks until the Olympics and ParaOlympics are over, and find some temporary work stacking shelves so I can at least pay my bills. Yes, it really is that bad. Oh Glenn, I really hope this is sorted for next time. How utterly demoralising for you. How completely crap. Don't even know what to say.